Kalifornia Love: Holy Moly It Worked!! 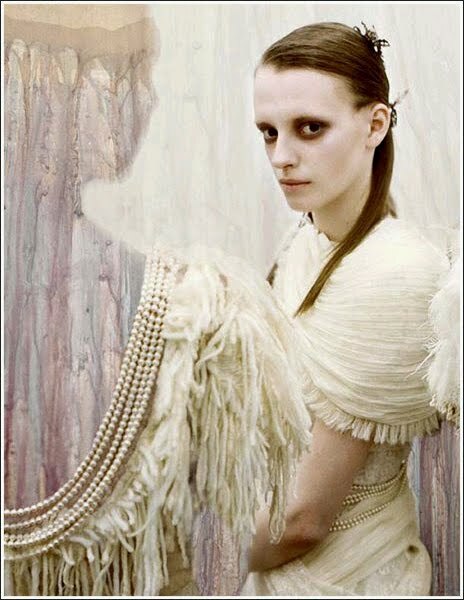 MAC Will Be Donating ALL Proceeds from MAC for Rodarte..
Holy Moly It Worked!! MAC Will Be Donating ALL Proceeds from MAC for Rodarte..
All the kicking, screaming, and being upset with MAC, passing the petition around, and angry phone calls and emails has finally paid off. MAC will no longer be donating $100,000.00 -they will be donating 100% of the proceeds from the MAC for Rodarte Collection to the Women and Girls of Juarez Initiative and I am so, so happy. I am so amazed that "our" outrage actually caused MAC to change their minds. Because of all our voices, MAC decided to donate $100,000.00 -which they were not going to originally do. However, we continued voicing our concerns and now they're donating everything and I'm just again, truly amazed. We made a difference by joining together and we can continue to do so with anything. Sure I'm a little upset that MAC didn't even plan on donating a dime to the situation in Juarez but it is truly generous that they turned it around and are now donating all the proceeds. Prior to the announcement that they'd be donating the $100,000, I wrote that I was weary of buying anything from the collection because it seemed so wrong. After the announcement, I still didn't want to because I wanted them to donate all of the proceeds. Now that MAC will be donating 100%, I feel that we should buy something, or a few things, from the collection. I along with most college students can't buy everything of course as we don't have the funds for it but I'm going to do my best. Just a reminder (for anyone who cannot buy anything from this collection at this time).. we can always help later too -through donations. Again, I'd just like to thank MAC for turning around and becoming aware of the situation and for being so generous. I'd also like to thank God and the Virgin Mary. I've been praying to them since this whole thing exploded -asking that a change be made and that change has been made and I'm so thankful. I hear so often people saying that prayer doesn't work but it only doesn't work when you don't believe in your own prayers. It also takes time -nothing happens over night. Please, if you do pray (I'm not trying to offend people who don't), continue sending out your prayers to the people living in Juarez. I am so happy that they'll be receiving some much needed help. MEXICO CITY, México, July 29, 2010 – In response to public concern over the limited edition MAC Rodarte makeup collection, set to launch in fall 2010, MAC will donate all of its global profits from this collection to a newly created initiative to raise awareness and provide on-the-ground support to the women and girls in Juarez. MAC and Rodarte are deeply sorry that this makeup collection was so offensive to the people of Mexico and concerned global citizens. During the meeting, held at the Mexican Ministry of Foreign Affairs, this collective group committed to working together on the overall direction of the new initiative to help the women and girls of Juarez and to raise global awareness of their plight. MAC executives reiterated their deep regret and reinforced that it was never MAC’s or Rodarte’s intent to minimize the suffering of the women and girls of Ciudad Juarez. In the coming weeks, MAC and Rodarte will be consulting with members of CONAVIM´s advisory board, as well as other local and global experts, to develop a comprehensive framework that provides grants to local and international organizations with a track record of improving the lives of the women and girls in Juarez. “We are deeply sorry and apologize to everyone we offended, especially the victims, the women and girls of Juarez and their families. We have heard the response of concerned global citizens loud and clear and are doing our very best to right our wrong. The essence of MAC is to give back and care for the community and our initial handling of this makeup collection was not reflective of MAC’s values. MAC and Rodarte are committed to using these learnings to raise awareness on this important issue and to leverage our unique platform to help the women and girls of Juarez,” said MAC President John Demsey. “Rodarte is committed to using creativity for positive social change. As designers, we strongly feel it is our responsibility to use ideas and actions for the good of our global community and are truly sorry for the offense we have caused. We are raising our voices in support of the strong women and girls of Juarez and joining others who are working internationally to improve their lives,” said Kate and Laura Mulleavy, designers of Rodarte. Last week, MAC and Rodarte announced they would also be renaming the products and redesigning the marketing materials associated with the collection. MAC has a longstanding tradition of service in Mexico, supporting important social causes in the country such as HIV prevention and treatment. Since 2002, the MAC AIDS Fund has donated hundreds of thousands of dollars to local entities, including Fundación Eudes, La Casa de la Sal, A.C., Ser Humano, A.C., Mesón de la Misericordia Divina A.C., Pirana Studio, and Fundación Unidos por un México Vivo. MAC has had operations in Mexico since 1999. The brand currently employs more than 150 local professionals. Wow! This is so good to hear, we did it : ) I really hope the money does reach those in need and that it will really help the cause that is Juarez. Thanks for posting this, Kali. Now if only we could get Rodarte to sound even a tiny bit remorseful. Yupee I am so happy everyone's prayers and hard work finally paid off now I can say 'aww MAC people are so nice' they say everything happens for good I was wondering a few days back why MAC chose this name for their collection ?now I see may be that's how a lot of people came to know about juarez even I myself was unawre but I am so so happy, abuse and violence against women and children always effects me everytime I hear such news I become frightened and feel really sad for them I hope one day juarez will become a peaceful place . It may sound strange I even prayed for them on "shab barat" it is a holy night and in my religion we believe that this night Good listens to everyone's prayers and this night it is decided what is going to happen in the next coming year . I hope God has planned something good for juarez and all such places and for everyone. You are an amazing girl, with such a big heart. I had no idea this was going on honestly, but I'm so glad there's people like you fighting for justice. @ Val.. I know.. we did it!!!! I seriously still can't believe it. I really hope the money does help them out though and does LOTS of good. @ PoorCollegeStudent.. I was thinking the same thing. This entire time, it seemed as though MAC stepped to the the plate while Rodarte sort of sat back. I hope they ARE really sorry. @ Alvira.. I know!! I'm happy that they're apologetic and are now doing something so amazing and kind -even if we had to push them. Abuse gets to me too and I too felt very sad about the situation. It makes me feel blessed for what I have -these people are living in a place full of nonstop violence and I feel so bad for the victims, their familes, and anyone who has to be in the middle of all of that pain. God does listen to all prayers and I feel as though things will turn around. This is just one of the many steps before a full change can occur. P.S. It's not strange that you've been praying for them -that's great! @ Laura Beth.. I'm just so happy that so many people felt this way too -because a whole bunch of people really took action. I checked the petition and there are 1306 signatures!! ooooh yeah that's called bad market research... you think a big name like MAC would do their research on naming their products accordingly! yikes!! !